By Laura Arenschield, a freelancer writer from Worthington, Ohio. In the 21 years since she left Ohio Wesleyan, Arendt has become an international expert on ways to keep pregnant women — and their babies — alive. 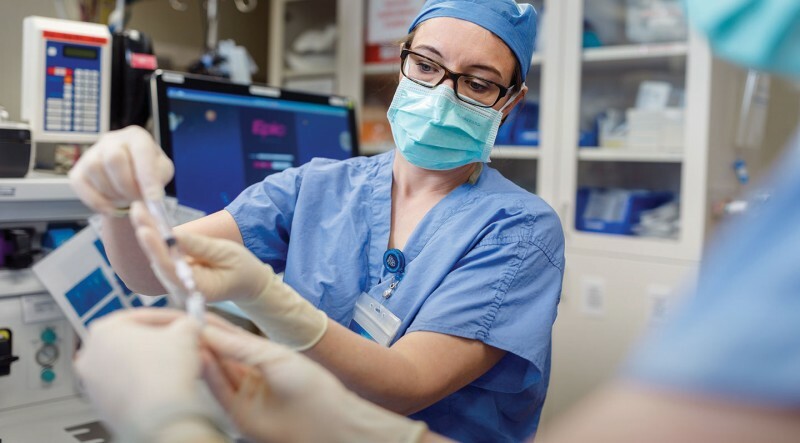 She has gone from Mayo Clinic medical student to the clinic’s medical director of obstetric anesthesiology to the associate practice chair for the department, overseeing a team of more than 400 anesthesiologists and nurses in one of the country’s best medical research institutions. Dr. Carlos Mantilla, chair of the Department of Anesthesiology and Perioperative Medicine at Mayo, says Arendt is at the forefront of providing new understanding and addressing the gaps in current knowledge about maternal mortality and morbidity, in particular with women with cardiac disease, not just at the Mayo Clinic but around the world. “When someone has to look up ‘What do we know; what is our understanding; what is new about this topic?’ hers are the articles they would go to,” Mantilla says. Her success is no surprise. Arendt has always been a high achiever. She won full scholarships to both OWU and the Mayo Clinic College of Medicine, completed her medical residency and internship at the clinic, then earned a prestigious fellowship in obstetric anesthesiology at Brigham and Women’s Hospital in Boston. A self-described extrovert, she bubbles over with energy, exuding happiness and laughing as she tells stories about everything from her days on Sandusky Street to her three kids (two girls and a boy, ages 15, 12, and 8). But when it comes to her research, she turns serious, because the problem is serious. Arendt’s role is to help build the kind of medical care team that keeps women alive during childbirth — a feat that has become more difficult in the United States over the last 25 years. From 1990 to 2015, the rate of women in the United States who died during childbirth increased by 16.7 percent, the exact opposite of what happened in the rest of the world, according to a systematic analysis by the United Nations Maternal Mortality Inter-Agency Estimation Group. 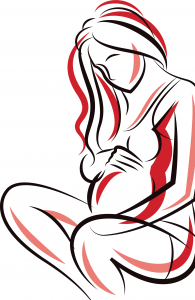 Prenatal care is not a given in the United States. The fact that we’re losing mothers during childbirth is the biggest failing of our healthcare system. That is where Arendt comes in. Her research and her work as an obstetric anesthesiologist have focused on pregnant women with medical conditions like congenital heart disease — conditions that put them at higher risk for dying or getting very sick during childbirth. The most at-risk of at-risk women come to her Mayo Clinic team during their pregnancies, and she works hand-inhand with obstetricians, perinatologists, neonatologists and other medical specialists to find ways to get them through delivery safely. 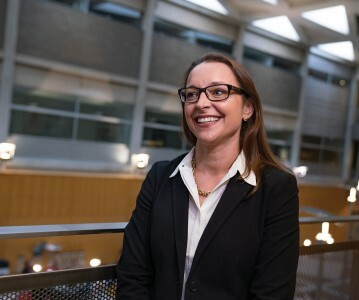 She also leads research into the causes of increased maternal mortality, and into new approaches to treatment that could help more women survive. “We are the right hand of the obstetrician for critically ill pregnant patients,” she says of the work obstetric anesthesiologists do. The reasons that women die during childbirth are as complex as their medical conditions, but, as Arendt wrote in a 2014 paper, nearly half of the deaths worldwide are caused by hemorrhaging after giving birth. About a fifth of the deaths are from complications related to hypertension and another fifth from acute heart problems, including heart attack. Almost all of these deaths are preventable. The most recent data has shown that more and more women in the United States are dying as a result of cardiac disease, which has inspired her to collaborate with other specialists worldwide to develop best practices. 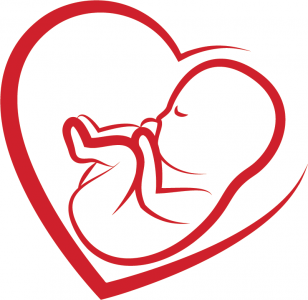 Arendt has worked with national and international organizations to hold symposiums, collaborate on research, and write guidelines for the care of patients with cardiac disease in pregnancy. Arendt believes our changing society is a big factor in declining maternal health, including the increased likelihood of health conditions during pregnancy that come with women choosing to have babies later in life. Her work also addresses our nation’s increasing obesity and the complicating factors of abuse, addiction, poverty, and huge disparities in outcomes when comparing black women to the rest of the population. When Arendt speaks around the world, she tries to drive home the point that her work has shown over and over again: Doctors who focus on delivering a healthy baby often overlook additional health issues that could harm a mother. Because of that, mothers are dying. This passion for helping women, especially women who might be overlooked, began when Arendt was an undergraduate student double-majoring in chemistry and philosophy. “Ohio Wesleyan was this place that gave me this incredible, broad experience,” she says. To an outsider, OWU might have seemed inevitable for Arendt. Her parents, Elizabeth Fraunfelder ’71 and Nicholas J. White ’70 met at OWU, as did her maternal grandparents, Marian Buchwalter ’36 and William A. Fraunfaulder ’36. Her grandfather, Nicholas L. White ’52 and great-grandmother, two uncles, and an aunt are also alumni. In fact, when Arendt came to tour the campus, her grandfather’s photo was hanging up in the gym — White managed the men’s basketball team that won the 1948-49 Ohio Athletic Conference championship. Arendt had already been accepted through early admission to Princeton University, which her sister attended. She was pretty sure she wanted to be a doctor, and the chance for an Ivy League education was enticing. “But then I visited Ohio Wesleyan, and it felt like I would be free to explore and grow — and I thought if I went to Princeton, I would be more focused on performance and perfection than becoming the best form of me,” she says. Ohio Wesleyan also allowed her to keep playing soccer, a sport she loved. A presidential scholarship allowed her to attend tuition-free, and she never looked back. She made friends from around the world, including her roommate, Farida Khwaja ’98, who came to OWU from Pakistan (see story about other Pakistani alumni). During her junior year, Arendt traveled with a group of friends from a campus Christian group to south Texas as part of the ARISE Border Witness Program, which helps empower women along the Rio Grande River to improve their communities. And she learned about the ways in which women often encountered roadblocks — both professionally and in how they received medical care. She returned to her studies with an even more determined focus, tackling philosophy texts and chemistry experiments with the memory of real women she’d met who might benefit from her advocacy and research. At OWU, “I kind of became a feminist,” she says now. She interned one summer in Washington, D.C., with a public-affairs consultant group named Bass and Howes, Inc., which provides grassroots organizing and network building around progressive issues, especially women’s health issues. She also had the chance to conduct summer chemistry research. Studying philosophy and taking English composition classes at OWU, she believes, improved her ability to write. The close-knit campus allowed her to have personal relationships with her professors. And she thinks both made her a better doctor. “I don’t take those parts of my education for granted,” she says. “The ability to deal with ambiguity, to hold a lot of thoughts in suspension — to know that the world isn’t black and white or right and wrong — you’re not going to learn that in medical school. After graduation, Arendt went to the Mayo Clinic’s College of Medicine, then completed both a residency and internship at the clinic. She was in Rochester when she met her husband, Patrick Arendt, who played Division I hockey at the University of Notre Dame. He is now a self-employed criminal defense attorney, which gives him room to get their children to school, extracurricular activities, and friends’ houses to hang out. But that doesn’t stop Arendt from trying. 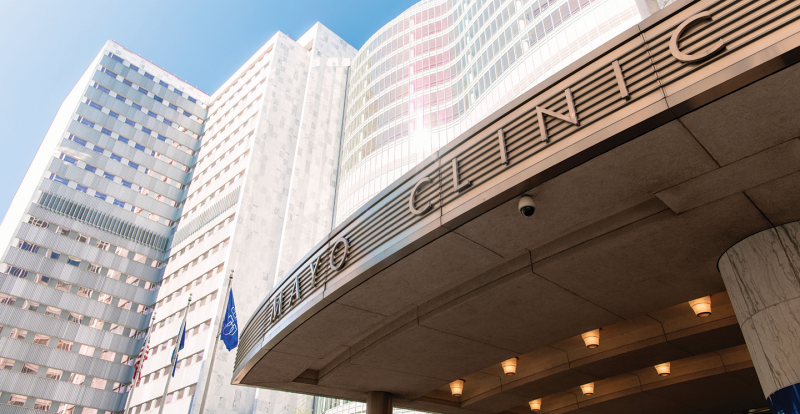 At Mayo, she has championed new programs that improve women’s and babies’ chances of surviving childbirth, specifically in the use of anesthesia during fetal surgery — surgeries on a fetus in the womb. The ability to deal with ambiguity, to hold a lot of thoughts in suspension — to know that the world isn’t black and white or right and wrong — you’re not going to learn that in medical school. The anesthesia in those cases is complex, but complexity is where Arendt shines. She helped build a Mayo Clinic perinatal program that unites obstetricians, neonatal caregivers, nurses, midwives and other medical professionals to save high-risk pregnant women — those with, for example, cancer, organ failure or heart disease. Curry calls Arendt’s combination of passion and expertise rare, even at Mayo. “Even in (this) kind of environment, at our institution, she stands out. And that’s impressive,” he says. Last fall, Arendt returned to campus to speak at the Women of Ohio Wesleyan biennial leadership forum, where she connected with other alumnae who are leaders in their fields. Her career has been gratifying, challenging, and rewarding, but Arendt says she was humbled to see the impact Ohio Wesleyan women have had on the world. “There are graduates from OWU teaching in low-income areas, working to provide healthcare to people in impoverished countries, and doing social work, ministry, and nonprofit work for which they are poorly paid while providing invaluable services to others. They are working to fix the social issues, education lapses, racial disparities, and income disparities that are at the heart of poor prenatal and newborn care,” she says.